An aerial bi-axial tourbillon mechanism. A vertical power reserve. Individualist seconds. A stripped-down dial and spectacular volumes: the latest specimen from the C Lab Series defies all theories. Even better, it creates its own rules: emptiness is its core material, engineering its constancy; chemistry a dare and transparency a must. Designed and developed by the C Lab Series, the C1 QuantumGravity symbolizes unrestricted and unconstrained time, where only impulse and intuition prevail. A special unit dedicated to extreme watchmaking, the C Lab Series has a mission: to push the boundaries of mechanical watch making by introducing it to new modes of expression. Last year, the C1 Tourbillon Gravity timepiece inaugurated a new watchmaking era, where time liberates itself without reserve. In 2009, the C Lab Series is expanding this watchmaking metamorphosis to embrace new horizons. Initially devised in the fall of 2008, the C1 QuantumGravity was born after a 5-month incubation period, nurtured by the will and tireless energy of a team that works on instinct alone. BNB Concept was entrusted with the creation of the movement, while Studio Bellon finalized the design. The result: a new species of watch that lives time as if it were an experiment and space, a source of stimulation. The creation of the C1 QuantumGravity constitutes a provocative act in itself, while its construction is an exploration carried out at the brink of excess and defiance. A cylindrical piston. A vertical back-and-forth movement. Liquid. These were the three essential elements combined by the C Lab Series to create this astounding equation involving mechanics and chemistry. Traditional design and display codes have been demolished to make way for a mobile glass column, located between 12 and 1 o’clock, which serves as the power reserve with a vertical indicator. On the chemistry side of things, a liquid featuring green phosphorescent nanoparticles fills a tube to assist in the reading. Meanwhile, on the mechanical side, this energy gauge operates perpendicularly to the caliber, rising up and down from its base to signal the remaining energy of the movement in relation to its available three-day power reserve. Its graduated outline corresponds to level indicators, which are secured to the inner surface of the watch. Cables. A bi-axial movement. A lateral position. This collection of challenges had to be taken on to erect a spectacular tourbillon carriage. Exported to the timepiece’s Western border and literally suspended, it rotates in a multi-dimensional manner on two axes – the main one being vertical. Its baffling structure has adopted the rigid and light elevation of cable-stayed bridges: one arm, extended from cables measuring just 2/10th of a mm-wide and fastened to the plate, maintains the carriage vertically and thus reinforces the impression of an independent arrangement. The suspension mechanism is supported by an elastomeric self-tensing system, which enables the cable/arm hinge to be precisely adjusted and the dilatation effects, compensated. 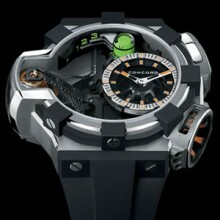 48.5 mm in diameter and 22 mm in depth: the appearance of a Titan, whose proportions reach a staggering 57.5 mm in breadth. Yet, the C1 QuantumGravity remains easily wearable thanks to its lugless design which ensures a perfect fit on the wrist. The use of Titanium for the case and Aluminum for the majority of movement components bestows a lightness on this timepiece that is as astounding as its size. The build of this watch composed of 511 parts is also offset by an anatomy that privileges space and transparency: the case, whose machining required 400 hours of fine adjustment, can be reduced to a structure that is literally enveloped by 5 sapphire crystals. The mechanism is visible from all angles. Although the case and movement share a genetic bond as they were made for each other, they are flanked by other elements that seem to operate self-sufficiently: to the West, a glass excrescence house the tourbillon carriage while to the East, two symmetrical casings house the winding mechanism and the seconds, at 2 o’clock and 4 o’clock respectively. Concealed entirely, the imposing time-setting key can be ejected from its armor by simply pressing on the push button. As for the seconds, they evade the dial to nestle on the side of the case. They are engraved in luminescent orange against a black aluminum roll and can be seen through a window whose cut echoes the push button of the crown. 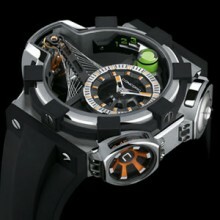 A lateral sapphire crystal reveals the rotating orange blades of the seconds wheel. The dial has also been contaminated by this urge for maximum openness. Although it strives to display the flight of hours and minutes, its focus is on empty spaces. The depth of its field of vision is dizzying, the feeling of levitation exhilarating. Deconstruction, a concept so dear to Concord, has been magnified: the C1 QuantumGravity apprehends time as a perspective, using emptiness as a material on which time features are grafted. Under the impressive sapphire crystal, the panorama, amplified to its utmost, outlines time that has almost been dematerialized. And despite the exuding madness, legibility has remained at the core of its construction. Just like a suspended glass saucer, the off-centered hour-circle between 3 and 4 o’clock dresses a part of the cavity at the bottom of which the movement is supported. A spider-like structure acts as a scaffold under the transparent disc punctuated by the luminescent orange markers. The 6.5 mm high hand-fitting is a technical prowess in itself and adds to the feeling of dizziness. Wedged at the bottom of the abyss, the mechanical manually wound movement choreographs time with precision. An officer-style case-back which appears as an air-lock at every opportunity reveals the geometric circuit, the right-angled skeletonized bridges, the gear-trains that transmit energy to the tourbillon carriage and the cable adjustment. The finishing touches highlight an industrial design that is both methodical and futuristic: a black aluminum plate against anthracite aluminum bridges, rubies against polished steel screws… They embody the spirit of a watch made with high-tech materials, glass, emptiness and colored luminescent materials. The C1 QuantumGravity defends time that is inexorably linked to space. Prophetic, its construction created in record time propels Concord into a parallel world where intuition is a favored ally and its design and mechanics a harbinger for the future of watchmaking. An addiction to breaking established codes and extrapolating underlies Concord’s creative mettle. C1 QuantumGravity is its ultimate creation. 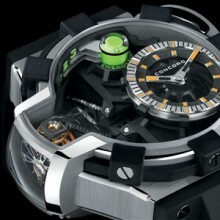 Go to www.c1-quantum.ch to find out about how this exceptional timepiece, in a limited edition of 10, was created.